“It is always painful to part from people whom one has only known for a very brief space of time. The absence of old friends, one can endure with equanimity. But even a momentary separation from anyone to whom one has just been introduced is almost unbearable.” This line from Oscar Wilde’s classic play, The Importance of Being Earnest, has taken up permanent residence in the mind of Judi Dench. She remembers it precisely because it proved challenging to memorize when she played the role of Cecily in a production long ago. When she recites the words in Roger Michell’s delightful documentary, “Tea with the Dames,” they resonate in a new and poignant way. As Dench trades stories with her longtime chums—Maggie Smith, Eileen Atkins and Joan Plowright—we are reminded of the multitudinous characters they have immortalized for generations of audiences. Their frequent presence in our collective imagination may cause us to embrace these women as old friends, even though the vast majority of us have never met them in person, let alone seen them perform onstage. 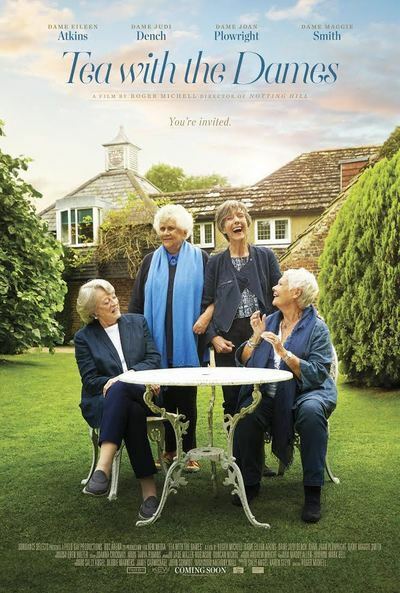 Michell’s film allows us the privilege to spend an unscripted hour or so with the four acting goddesses during their routine visit to Plowright’s home in the English countryside, and though our time with them is brief, the very thought of our world existing in their absence is almost unbearable. Smith may be the first person I ever encountered who made acting look as effortless as breathing. She sported a tremendous range in three of the films I watched repeatedly throughout my childhood, from warm and nurturing in “Hook” to uptight and deadpan in “Sister Act” to ferocious and tragic in “The Secret Garden.” Those three performances are an acting masterclass in themselves, each concluding with a smile that brought tears to my eyes for different reasons. Whereas her beaming expression conveyed a sense of relief in “Hook” and pride in “Sister Act,” the humbled antagonist she played in “The Secret Garden” grinned as if her facial muscles had decided to give geniality a test drive. So deft are Smith and her pals in maintaining an impeccably nuanced pokerface that it is liberating to watch them gab and guffaw here with unvarnished giddiness. Perhaps an even more fitting title for this picture would’ve been “Grand Dames Gossiping,” an appellation evocative of Frank Oz’s equally pleasurable documentary, “Muppet Guys Talking,” released exclusively online back in March. Like Oz, Michell frames each scene to make us feel like an observer in the room, invited to eavesdrop on every priceless nugget shared by his subjects. He makes no attempt at muting his voice when suggesting discussion topics, nor does he conceal his crew members as they scamper through a shot, one of whom catches the distracted eye of Smith as he snaps pictures of her while out of frame. As she positions herself in a chair alongside Dench, she laughs, “When have we ever sat like this?”, drawing attention to the conundrum of staging spontaneous interactions. Michell shares Oz’s philosophy that we are, in essence, “always rolling,” and understands that footage relegated to the cutting room floor is oftentimes no less interesting than what typically ends up in the final cut. Less inspired are the film’s montages, which assemble clips according to generic topics such as “winning awards” or “becoming Dames,” with the exception of a vibrant ‘60s-era sequence set to the Rolling Stones’ “Not Fade Away.” Only in moments like these do we catch flickers of the foursome’s chameleon-like genius. What made “Muppet Guys Talking” so special, apart from it being directed by Jim Henson’s closest collaborator, was that it examined precisely how the Muppeteers’ working environment was creatively invigorating and utterly life-altering. “Tea with the Dames” is much looser in its focus and not as enlightening as one might hope, though that doesn’t stop it from delivering more laughs than any mainstream comedy I’ve seen in 2018. Opening with charming footage of the ladies tuning up their voices like instruments, Michell’s movie plays like the jazzy riff of a seasoned quartet, complete with buoyant solos that may not connect to much else but are still a joy to witness all the same. There are times the Dames resemble a British equivalent of “The Golden Girls” minus the altercations, though they aren’t above administering an affectionate ribbing, especially when directed at the ever-employed Dench. None of them are eager to discuss a topic as bleak as death, a fact demonstrated when Miriam Margoyles asked Dench whether she had sorted out her funeral arrangements, to which she replied, “No, because I’m not going to die.” Smith is quick to side with Dench, and it’s not hard to agree with them, since they seem to possess enough vitality for several lifetimes. After Dench was “stung on the bum by a hornet,” she blew her top upon being asked by a teenager whether she had a caregiver. “I just did eight weeks in A Winter’s Tale!” she fired back. Michell is no stranger to working with legends, having directed Peter O’Toole to his final Oscar nomination for “Venus.” The filmmaker’s gift for working with actors may have received its finest showcase in 2002’s “Changing Lanes,” which featured some of the best work ever delivered by Samuel L. Jackson and Ben Affleck. His knowledge regarding an actor’s comfort level serves him well in this picture, illuminating the humanity of larger-than-life icons rather than merely gaping up at them in awe. Smith, Dench and Atkins—all of whom were born in 1934—seem to share a certain reverence for Plowright, the eldest member of their group, who will turn 90 next year. Recalling her own conflicted feelings about some of her husband’s performances, she speaks eloquently about the dividing line between “actual truth” and “illusion,” while voicing her dislike of naturalism when applied to the poetry of Shakespeare. Dench notes that poetry can be made naturalistic by bringing it down to one’s own level and size rather than reaching upward, a principle she goes on to illustrate during the film’s haunting epilogue. As we view stills of each woman in her youth, Dench recites Prospero’s most iconic lines from A Midsummer Night’s Dream, affirming that these extraordinary artists are little more than spirits “melted into thin air.” They may leave not a rack behind, but the illusions they brought to life are the stuff dreams will forever be made on.